CircumSolar, Migration 3 is a contemplation on migratory sea birds captured during their breeding season at Látrabjarg, the western most point of Iceland, which is the largest bird cliff in all Europe—14 km long and up to 440 m high—hosting up to 40% of the world population of some species. At any moment, be it day or night, there are great bird migrations taking flight. Ornithologists estimate that more than 5 billion birds annually journey across the hemisphere. Even greater than the complex weather systems, bird migration is the one unifying natural phenomenon in the world. As an immigrant myself, I am interested on issues of migration, of both animals and humans, and just like birds, we—scientists, farm workers, presidents, artists—journey back and forth dozens of times in the course of our life, establishing migratory patterns. Current immigration crises around the world, and specifically along the Mexico / U.S. border, where hundreds of migrating children, women and men have lost their lives, questions the geopolitics of territorial boundaries. 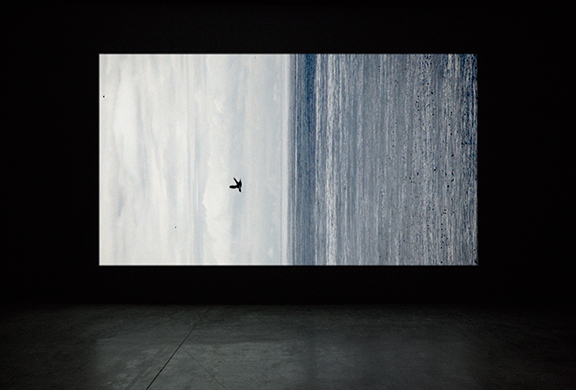 Formally, the video image is experienced vertically, defamiliarizing the seascape, so that the boundary dividing sea and sky becomes unstable and blurred. The spatial shift, together with a low video frame rate furthers this abstraction so we may understand the migratory impetus as code; a genetic code for evolutionary preservation. With this work, I reflect on how we as human species no longer have an understanding of our place within the greater scheme of life. 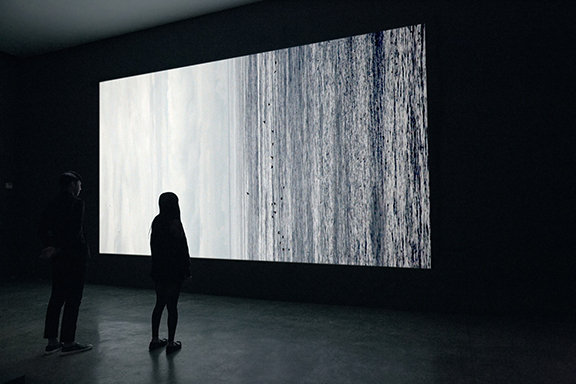 CircumSolar, Migration 3, 2013; single channel video projected at architectural scale, color, sound by Drew Schnurr; 11 × 22 feet, 17:46 minutes. 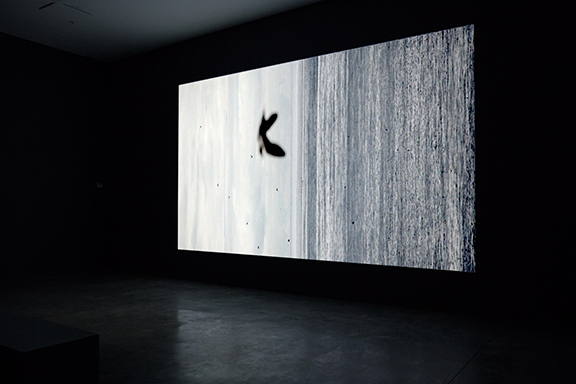 Installation view at ‘REALSPACE,’ Williamson Gallery, Pasadena, California, 2014.